Bruegger’s 300 plus locations all across the country will host Free Coffee Day on November 14th. They are inviting guests to come in until 2pm and enjoy one piping hot cup of Bruegger’s coffee per person and in return make a spare change (or more) donation to their local Children’s Hospital using the canisters located by the registers. All money collected will be given back to that location's neighborhood hospital. In 2011, guests contributed more than $30,000 on FREE Coffee Day. Each year, Bruegger’s offers membership in its Bottomless Mug Club – for just $149 members receive a Travel Mug, wallet card or keytag and receive free, limitless refills of coffee, tea or soft drinks throughout the following year. 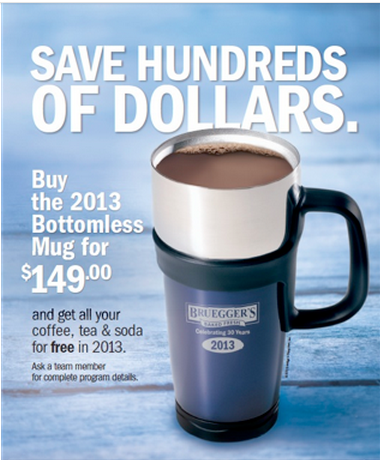 The Bottomless Mug saves the user an average of $300 a year. For the third year, Bruegger’s has partnered with Children’s Miracle Network to make the Bottomless Mug even more special. For every mug purchased, Bruegger’s will donate a portion of the proceeds to Children’s Miracle Network benefiting local children’s hospitals throughout the country. Lat year, Bruegger’s donated nearly $100,000 for Children’s Miracle Network. So mark your calendar for November 14th for FREE coffee and show some love for the Children's Micracle Network!